Fidelity Chess Challenger 3. 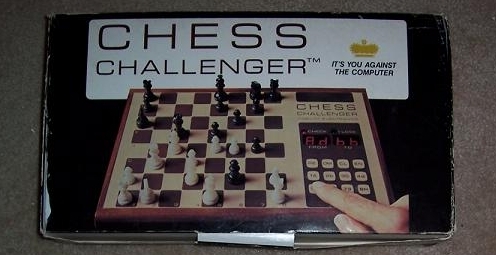 This model was released shortly after the very first commercial chess computer was introduced: the Fidelity Chess Challenger 1. Buyers of the CC1 could send their units and get an upgrade, i.e., receive the CC3. It is very similar to the first model except that Fidelity added 3 levels of play, enhanced the program with some basic openings and last but not least, they fixed the mix-up with the ranks and files. Now you could play the computer using the correct notation E2E4 instead of the awkard 5B5D! (see pictures). It could also demonstrate moves for you. It had the same wooden pieces and power adaptor. The manual was also very similar and it indicated that you could again upgrade the unit.